For me, one of the big difficulties of sticking to a regular exercise routine is the time you have to commit to it: apart from the time in the gym there's the travel time to & from, time cooking healthy, and time planning your menus & workout routines. It's nice when I can incorporate physical activity into something I need to do anyways, like commuting. There have been a few times when I was able to commute by bicycle to school & that was so great for my legs! Plus what took 20 minutes by car only took 30 minutes by bike, so round trip I got 1 hour of exercise for the low cost of only 20 minutes out of my day! I sometimes entertain the idea of building a recumbent bike with the full aerodynamic fairings to use as a short range, occasional commuter. I was searching on line for such bikes & came across a guy who built one for a 24 hour distance record that he set. Greg Kolodziejzyk of Calgary, Alberta, Canada & his team built this bike named Critical Power that he went 650 miles in a 24 hour period. Greg keeps a great blog (adventuresofgreg.com) that talks about past, current & future projects, plus has some inspirational/motivational messages about fitness & achieving goals. Check out his motivational speaker site & get yourself a free copy of his book Bold. I like what Greg's doing so I made him an oval sprocket for his record attempt boat. 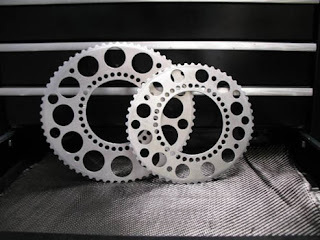 According to him the deal with oval (elliptical) sprocket rings is he can rotate the ring such that the widest diameter of the oval coincides with his optimal pedal torque position. I also threw in a 55 tooth sprocket for his training bike. No pit stops he pedaled through the night and received hand offs of water & food. 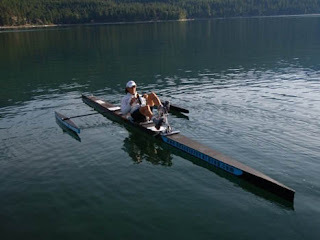 Final result a world record: 245 kilometers (152 miles) in 24 hours!